The Magatama represents the overlapping shapes of the sun and the moon, symbolizing people's worship of the great universe. There are also many other theories for the shape. The hole in the Magatama symbolizes the blessed spiritual power provided through the link with one's ancestors to whom one owes one's life, while the mystic deep green color signifies the movements and throbbing of life, like the fresh sprouts and shoots in spring. During the Jomon period, people made pendants in the shape of animal fang and that shape was carved onto stones. 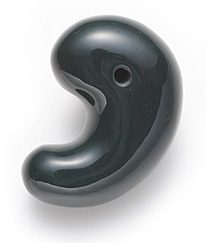 It is said that a kidney takes the shape of Magatama when dried and turns green, too. It is said that the Magatama could have been a broken ketsu (disc-shaped) ear ornament being reused. The tomoe (comma-shaped) design The tomoe is used to represent the Yin and Yang, such as seen in the flag of South Korea, roof tiles, and family crests. It is said that the bent 'key' shape can repel evil spirits. One could also wear it around one's neck with the end of the Magatama protruding outward to repel unwanted things and protect oneself. 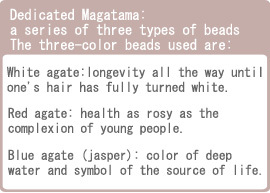 There is the theory that the Magatama is a symbol of the moon deity. The crescent moon and the Magatama in Nihon Shoki (Chronicles of Japan) are all of a blue or green hue and thus these colors became associated with the color of the moon. Protects one's health, eliminates calamities that may harm one's body, and has strong power to repel evil spirits. Mt. Kasen near Tamayumachi in Izumo produces good quality red agate and blue agate stones. 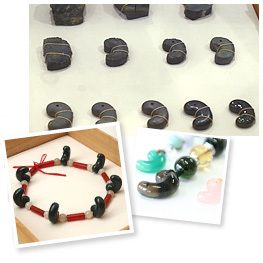 In ancient Izumo, tamazukuri artisans handcrafted many Magatama beads using agate stones produced there. Izumonokuni-no-miyatsuko (or Izumo Kokuso), a position at Izumo Taisha shrine in charge of the shrine's religious rituals, has been passed down since the times of Japan's mythology. Solemn ceremonies are held when a new Miyatsuko is appointed, including one ritual where Izumo's tama bead is dedicated to the Imperial family. 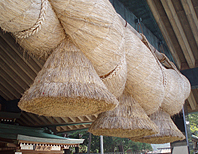 Used by the Izumo Taisha shrine, as well as dedicated to the Imperial family. The uniquely rounded shape is perfectly and beautifully balanced. The Izumo Magatama beads are now being created by 4 artisans working at the Izumo Magatama no Sato Denshokan, who also supervise the production of the beads to control the quality.